R Cyriac, JC Dietrich, A Fathi, CN Dawson, KM Dresback, CA Blain, M Bilskie, SC Hagen, H Graber. “Wind Effects on the Choctawhatchee River Plume at Destin Inlet, Florida.” ADCIRC Users Group Meeting, NOAA Center for Weather and Climate Prediction, College Park, Maryland, 13 April 2018. A Thomas, JC Dietrich, JG Fleming, BO Blanton, T Asher, RA Luettich. 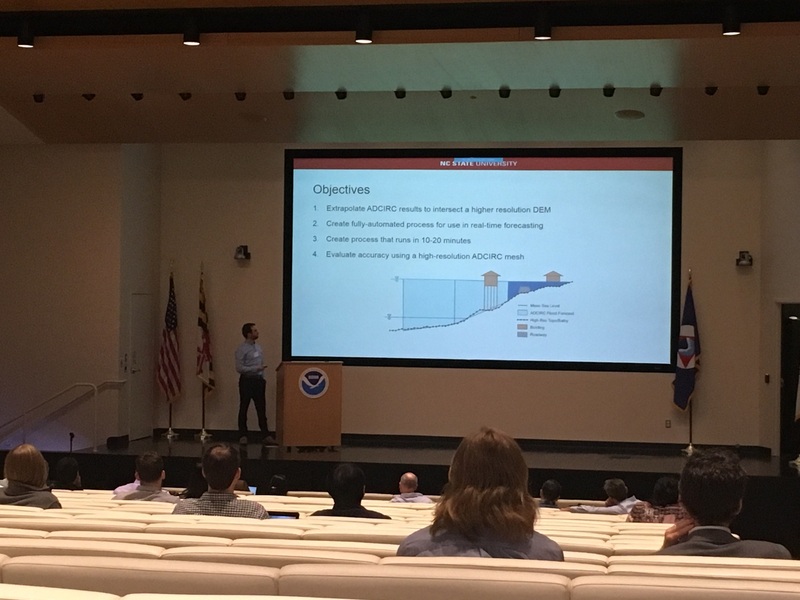 “High-Resolution Modeling of Surge during Hurricane Matthew.” ADCIRC Users Group Meeting, NOAA Center for Weather and Climate Prediction, College Park, Maryland, 13 April 2018. N Tull, JC Dietrich, TE Langan, H Mitasova, BO Blanton, JG Fleming, RA Luettich. 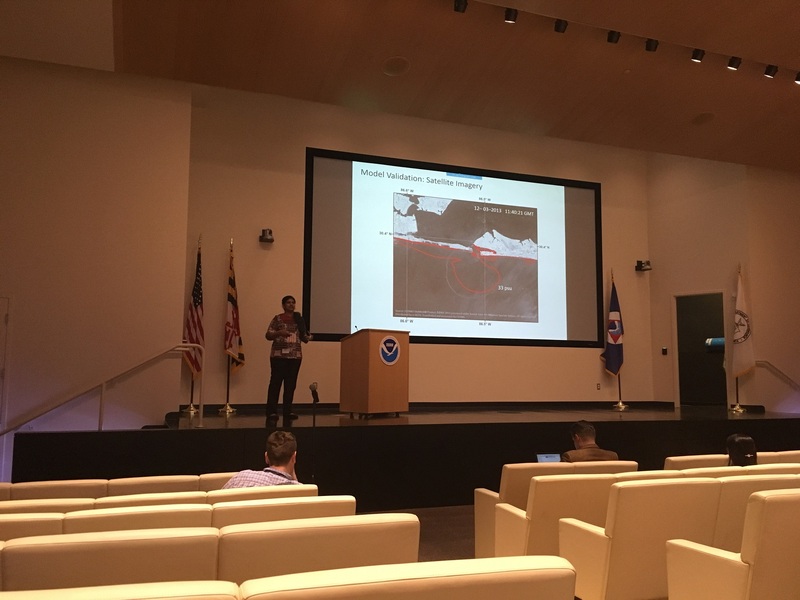 “Improving Accuracy of Real-Time Storm Surge Inundation Predictions.” ADCIRC Users Group Meeting, NOAA Center for Weather and Climate Prediction, College Park, Maryland, 13 April 2018. Rosemary Cyriac presenting at the ADCIRC Users Group Meeting on 13 April 2018. 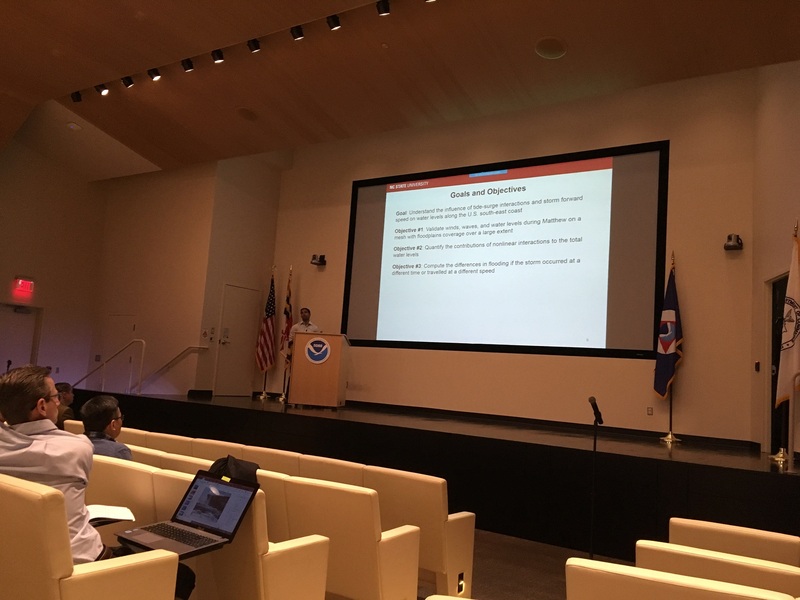 Ajimon Thomas presenting at the ADCIRC Users Group Meeting on 13 April 2018. Nelson Tull presenting at the ADCIRC Users Group Meeting on 13 April 2018.